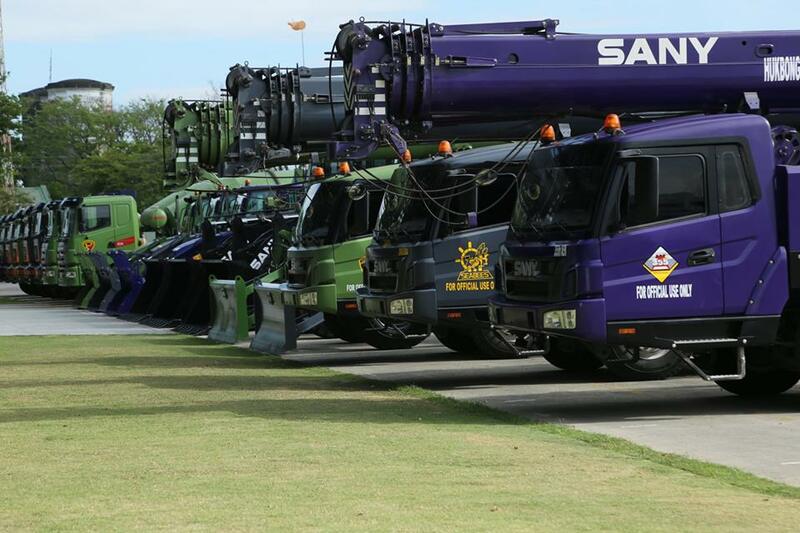 Heavy construction equipment made by China's Sany Heavy Industries were distributed to the engineering units of the Philippine Army, Philippine Navy and Philippine Air Force by the Armed Forces of the Philippines. Photo c/o Armed Forces of the Philippines. The Armed Forces of the Philippines (AFP) received the full delivery of various heavy construction equipment it purchased from China, which were formally distributed to the different engineering units of the various services branches. The AFP's Civil Engineering Equipment acquisition was done through a Government-to-Government (G2G) deal between the governments of the Philippines and China, in a deal worth PHP1.5 billion (US$28 million) as part of the Horizon 2 phase of the Revised AFP Modernization Program covering the years 2019 to 2023. The heavy construction equipment, which includes cranes, dozers, backhoes, and various trucks and machinery were supplied by China's Sany Heavy Industries. The Philippines' Department of National Defense (DND) also confirmed that China will be providing a military aid worth PHP1 billion (US$19.2 million), with the DND opting to receive a deployable bridge, water desalination and purification equipment, and ground-penetrating radar.